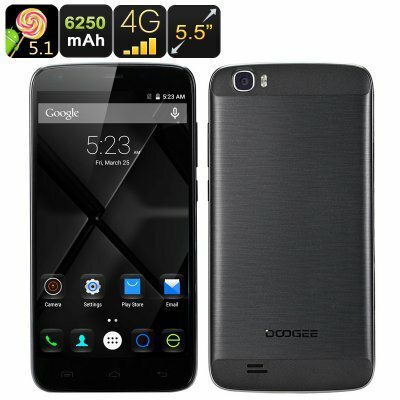 Successfully Added DOOGEE T6 Smartphone - 5.5 Inch HD Screen, 4G, Android 5.1, 2GB RAM + 16GB ROM, 6250mAh Battery (Black) to your Shopping Cart. The DOOGEE T6 is a great Android smartphone for all those who want to avoid frequent charging, If you don’t want to spend your time by the electric socket or dragging around hefty power banks, the DOOGEE T6 will get rid of these annoyances once and for all. The smartphone comes with the massive 6250mAh battery, giving you up to 29 hours of continuous talk time and a whopping 725 hours on standby. In addition to its large 6250mAh battery, the DOOGEE T6 sports a load of nice features. You will have a nice 5.5 inch HD screen for all your media and gaming + Android 5.1 operating system with access to the Play Store. With 16GB of internal storage and up to 32GB on an SD card, you will be able to get all the apps and tools you need. The T6 comes with great connectivity: 2G (GSM 850/900/1800/1900MHz), 3G (WCDMA 900/2100MHz) and 4G (FDD: 800/1800/2100/2600MHz). With two SIM cards, you will be able to manage two phone numbers and accounts from one device. The DOOGEE T6 comes with OTG for quick software updates and Hot Knot for efficient data transfers between compatible devices. Moreover, you will get to enjoy Smart Wake and Gesture Sensing – great navigation shortcuts for Android smartphones. Smart Wake lets you get to selected apps like Camera, Browser, Messages and more right form the locked screen. Gesture Sensing, as the name might suggest, will let you control certain phone functions with simple gestures.